MyMemories Blog: Meet this week's *Featured Designer*! It's MagsGraphics!! Meet this week's *Featured Designer*! It's MagsGraphics!! I have been scrapbooking in some form or another since I was 15 years old... My very first albums were on construction paper with the photos GLUED on and captions cut from magazines! Yikes! I transitioned from paper scrappin' to digital scrapping in 2007 - I LOVE being digital because I'm such a tech-head! Before kids, I was a 1st grade teacher; now I'm fortunate enough to be a stay-home Mom to our two sons as well as a digital designer for My Memories. Aside from scrapbooking, I'm a huge Buffy the Vampire Slayer and Harry Potter fan, and I love surfing the Internet, reading, and Facebook. I also play Words with Friends (user id is MagsGraphics) for those who want to challenge me. WARNING: I'm good! Well, how about that for a challenge!! If you're up for it - give her a run for her money! And speaking of running - why not RUN on over to Maggie's shop at MyMemories.com! She has about TWENTY of her great kits on sale this week!! WOW! Thanks Maggie! So check out the links below and see what's on your wish list! 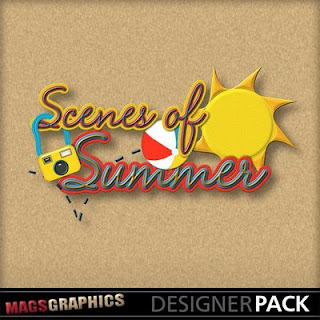 And check out this fun FREEBIE from MagsGraphics! And here are the TWENTY KITS that Maggie has on *SALE*!! Also be sure to check out MagsGraphics Facebook page and blog for more great info and sales! You can check out these other FREEBIES from Maggie too! And we have some winner's from last week's Featured Designer, Barb from Albums to Remember!! So, if you are *Scrappin' Lori*, Luanne, and Kristy Thiel - please email me to get the info you need to claim your prize! Email: LisaJ@MyMemories.com. Thank you so much for this post. I want to let you know that I posted a link to your blog in CBH Digital Scrapbooking Freebies (please, notice the new url for my blog), under the Page 2 post on Jun. 25, 2012. Thanks again. So good to see you as the designer of the week! Congratulations!